Anyhow, I guess when it rains it pours, like last year when we replaced our toaster and toaster oven at the same time. 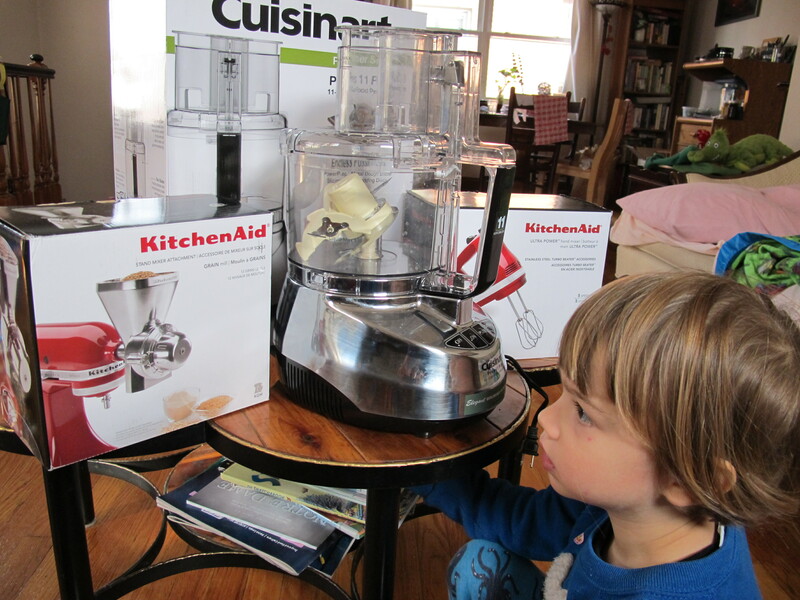 The current small appliance extravaganza started with a new food processor, a decision that’s been a long time coming. For the last ten years, I’ve been using a basic Black & Decker food processor. I don’t use it all that often, but given the usual life span of such things, I honestly expected it to die a long time ago. I’ve started making cashew butter fairly regularly (unlike peanut butter, I can make cashew butter cheaper than I can buy it), plus the occasional batch of sunflower seed butter. It also gets some use making hummus and veggie burgers, as well as pureeing squash. And it just keeps chugging. The problem is not really one of aging, but a design issue. The basic blend/process feature works fine, but the slicing/shredding blade is basically worthless. We’ve lived without this feature for quite awhile, making slaw, kraut, and potato pancakes the old-school way, thinking eventually the motor would die and we’d upgrade, but the darn thing just keeps on kicking. With plans to make a big batch of kraut (and after having recently made a big batch of root veggie pancakes, with only a little bit of shredded finger included), Matthew made the call to upgrade. After consulting Consumer Reports, we settled on a Cuisine Art. I must say, I was a bit underwhelmed when we took it out of the box. Other than having a stainless steel base, it looked a lot like the Black & Decker — was it really worth 3-4 times as much? Then Matthew tried slicing some chunks of cabbage and you guys! Magic! Beautifully shredded cabbage with the press of a button and really quiet (not whisper quiet, but quiet enough that I’m okay running it in our apartment after G’s in bed, which says a lot! In comparison, I probably should have worn hearing protection when using the old food processor). Anyhow, seeing is believing — this seems like a good purchase. If it stands the test of time and I’m using it 10+ years from now, then we’re really golden! Gabriel is starting to get really squirrelly when the camera comes out, but he actually asked to be in this picture — future small appliance model? No sooner had Matthew brought up getting a new food processor than our electric [hand-held] mixer began to die. It will still, sometimes, function on the lowest speed, but that’s all we can get out of it. We again turned to Consumer Reports and selected a fairly basic Kitchen Aid model (i.e., not the most expensive one that comes with all of the accessories). I don’t expect this to be a major upgrade over what we had, but something that works will be nice. This time last year, I borrowed my friend Kelly’s electric grain mill to mill our corn. We really enjoyed using our home-grown corn meal and flour in corn bread and baked goods throughout the year. Since it’s something we plan to continue growing, it [kind-of] makes sense to have our own mill (really, it would make the most sense to have one mill to share in some kind of neighborhood group, but since we don’t have that kind of set up . . . ). Matthew found this grain milling attachment for our stand mixer. I’m interested in seeing how it compares to the electric mill, which worked well, but, even on the coarsest setting, produced a corn “meal” that was more flour than meal (okay for some things, but really too fine for polenta and corn bread — we used our home-grown in combination with store-bought to get the right texture for those items). The attachment takes up much less space than Kelly’s stand-alone grain mill, so that’s another plus. And that’s a wrap on our purchases to date. It seems a little extravagant, but we spend a lot of time in the kitchen, and having these tools does make cooking from scratch easier. The kitchen is definitely where I would have the most difficulty being a minimalist! I’ll write more about the grain mill after we’ve taken it for a few spins (if it doesn’t work well, we’ll return it). I’m considering a soy milk maker, but I want to do a bit more research, including borrowing a friend’s machine to get a feel for the process and to make sure the product is something I want to consume. This entry was posted in My Life and tagged cooking. Bookmark the permalink. You know, I have yet to embrace small kitchen appliances. I keep trying, but honestly since the one kitchen task that I hate above all others is washing dishes, I just have a hard time bringing myself to use things that create so much of a cleaning mess. I always figure, that since I have to use a cutting board and knife anyhow, what’s the point of dirtying the food processor just to do the slicing part. The one thing I use all the time is my stick blender though – makes it SOOOO much easier to make creamy soups and sauces without the nightmare of transferring everything to the blender. I agree on the cleaning of small appliances being an extra chore (and I tend to baby mine by hand washing, even for parts that claim to be “dishwasher safe”). For that reason, I tend to save the food processor for bigger batches (like slicing 10 pounds of cabbage for kraut) rather than smaller tasks, like slicing a single head for slaw. I also try to get multiple uses out of one cleaning, so for the new food processor’s inaugural use, Matthew used it to slice cabbage, then I scraped out most of the cabbage and made hummus. I figure a few stray bits of cabbage won’t hurt my hummus. Or I’ll make cashew butter and then process some beans for veggie burgers. Two uses, but only one cleaning. I think having a machine with a slice/shred feature that actually works may mean I’m using this a bit more than before. I do put the metal beaters for the electric mixer in the dishwasher, making that a case where it’s easier to use the electric appliance vs. the hand-crank version that I have to hand wash (unless the dirty beaters are sitting in the dishwasher when I want to use them again!). I use my Ninja to do most processing and blending now and I like it. It has been a good purchase and I’m not compelled to upgrade to the OMG-expensive Vitamix, so there’s that. I will need a new hand mixer at some point. Mine was my mom’s…or maybe even my grandmother’s? It smells like something’s burning when I run it for more than about 30 seconds. Totally safe, right? Our electric mixer growing up was a pretty old school one. The cord detached from the main unit. I don’t know why exactly, but we kept the cord in one place, the beaters in another, and the motor unit in a third place, so using it was always a bit of a ritual, retrieving each part. I’ve was given a Kitchen Aid mixer years ago for Christmas and I use it all of the time. Before getting it, I had been through several cheap old fashioned mixers and the Kitchen Aid was like a dream come true for me. I’ve drooled over a Vitamix, but just can’t justify the expense for it. i love my kitchen aid stand mixer and kitchen aid food processor. i got both in the 90s and they are going strong. i got the meat grinder attachment at a thrift store and it works well – i dont use it that often. a note of caution on the grain mill. i was gonna get one myself a few years ago and in doing research discovered that the stand mixer attachments will fit all the mixers but only the really big motors can deal with grains and while my mixer wasnt the cheapest its motor was not good enough and i thought it best i not buy one. this was based on stuff i read thru google i am sure you could find out if your motor can handle it. i also invested in a spare bowl (and later got a bonus one thrifting) and that has been VERY handy for me if i am making a cake or something that needs whipped egg whites in addition to the batter. also i can have bread rising in one and make cookies with the other. i have a hand crank one, but i would love to get the pasta attachment. Good to know on the grain mill not being compatible with all motors. We’ll have to check before we use it. The pasta attachment is also on our list!